Acknowledged author Carol J. Huston MSN MPA DPA wrote Leadership Roles and Management Functions in Nursing: Theory and Application comprising 712 pages back in 2017. Textbook and etextbook are published under ISBN 1496349792 and 9781496349798. 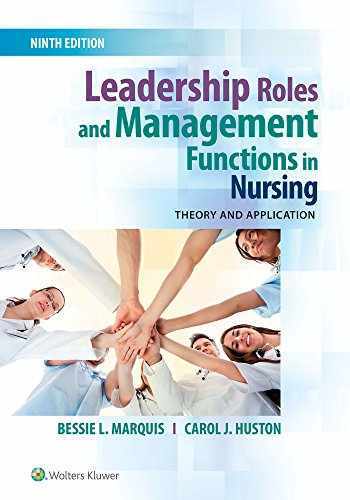 Since then Leadership Roles and Management Functions in Nursing: Theory and Application textbook received total rating of 4.5 stars and was available to sell back to BooksRun online for the top buyback price of $25.52 or rent at the marketplace. Awarded second place in the 2017 AJN Book of the Year Awards in Nursing Management and Leadership.Help your students develop the skills they’ll need on the job with today’s #1 bestseller.Taking an active learning approach, this Ninth Edition emphasizes the symbiotic elements of leadership and management. All professional nurses today face limited resources and emerging technologies, and this book prepares students through up-to-date and comprehensive coverage of leadership and management concepts, ranging from managing conflict and working collaboratively to organizing patient care and staffing. Benefitting students who often have limited opportunities to observe high-performing middle- and top-level managers in practice, a variety of real-world scenarios are featured throughout and provide opportunities for hands-on learning.New to the Ninth Edition:More than 280 learning exercises (26 NEW to this edition) help students see how concepts can be applied in a wide range of practice situations and health-care settings. The variety of learning modes in the exercises gives students opportunities to apply theory, develop strong critical-thinking skills, and internalize learning.Updated Content Crosswalks —based on the latest AACN, AONE, QSEN, and, new to this edition, ANA standards and competencies—show how content in each chapter draws from or contributes to content identified as essential for baccalaureate and graduate education, for practice as a nurse administrator, and for safety and quality in clinical practice.Updated content on new trends/developments in health care includes the Affordable Care Act, meaningful EHR use, projected nursing shortages, and newer care delivery models focused on ambulatory care and outpatient settings.Expanded coverage of workplace topics includes whistleblowing, liability of supervision of unlicensed workers, bullying, incivility, mobbing, workplace violence, and the authority-power gap.Improved leveling in the test bank allows for better assessment of student progress.